Emily Thorne’s entire life is about control. It has to be; she’s not really a person but a construct, a carefully crafted nuclear missile in human form, bent on destruction. This construct depends on extreme dedication and focus at all time, as even a slight slip could send that missile completely off track. So what does Emily do when she loses the very thing holding her life together—her mind? Of all the crazy, soapy ideas Revenge has thrown into the mix throughout its run, Emily having spells of lost time might just be my favorite. In fact, everything the show has done to shake up Emily’s world—starting with her wedding day—has completely reinvigorated what was a very, very stale revenge quest. It was getting to the point where Emily’s mission was so obtuse, it was impossible to tell what her end goal even was anymore. By completely tearing Emily’s world apart, the writers have suddenly made what was once a flaw into an asset. How can Emily have a clear endgame when she now can’t even account for huge chunks of her life? The only issue with Emily’s blackouts is that the idea of them is so far more interesting than their execution. Granted, the execution isn’t terrible, but it’s not played nearly as significantly or soapy as you would expect from this show. Two things saved it from being almost a weird afterthought amidst all of the other crazy things happening in this episode: Emily VanCamp and Gabriel Mann’s absolute commitment to the material, and the very clever tie-in to Emily’s mother. Emily’s mother’s presence on the show was pretty much a disaster, and much of it has been swept under the rug, so when Nolan brought up her mental condition, it felt almost like a revelation. Of course, this is why Emily is so concerned about the blackouts, on more than a logistical level. Sure, she could mess up her revenge scheme with the Graysons in the short term if the blackouts are due to her injuries, but if they’re more than that—if they’re a sign of a larger mental breakdown—then it’s game over. For a woman who has dedicated her life to one purpose, to have that purpose taken away is one thing. But to have it taken away before she can even attempt to fulfill it, that’s her worst nightmare. For as important as Emily’s blackouts are to her character and the show’s overall plot, they were but a small part of this very stuffed episode. Revenge has a lot of moving parts right now, and interestingly, they seem to all be moving in a way that is bringing them closer together. Conrad and Victoria’s divorce was inevitable and something we’ve seen before. Tweaking that story to include Conrad’s ex wife Stevie was an intriguing twist, especially when Conrad pulled out the scheme to show her as the owner of the Grayson mansion so Victoria would be evicted. What was completely shocking (in a great way) was the show’s commitment to immediately anchoring Stevie to the show by dropping the huge reveal that she’s Jack’s mother. That’s right. Conrad’s ex wife is Jack’s mother. It might not make any sense, but damn if that isn’t a fun twist. It’s also a great way to give Stevie an immediate tether to the greater mythology of the show and give poor, neglected Jack a storyline to boot. Jack and his long-lost mother working together to take down Conrad Grayson sounds like a heck of a lot of fun, and it’s far more interesting than Jack’s adventures in being in the most boring relationship every portrayed on film with Margaux. It will be fascinating to see how the show makes this revelation fit into the timeline and mythology of the show, but Jack’s mother has always been sort of an open question, leaving the writers the room to pull something exactly as crazy as this. 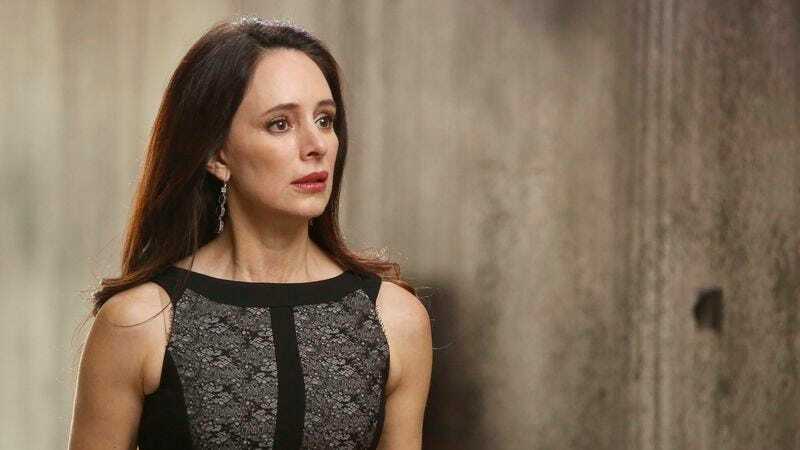 As if Emily’s blackouts and the reveal of Jack’s mother weren’t enough to cram into one episode, Revenge also took the time to throw in some good, old-fashioned murder as well. Meeting Patrick’s father in a previous episode was obviously a setup to bring him back in a bigger capacity, and that happens here when Patrick hires him to be the contractor to fix the burned gallery. (Remember when Patrick burned the gallery? Well played, Revenge.) It seems like it is going to be a story about Patrick either exacting revenge on his deadbeat father or finding a way to connect with him, but it turns into something far more sinister. It seems Jimmy Brennan was every bit the monster Victoria made him out to be, and in the process of protecting Victoria from being harmed by him again, Patrick accidentally gives Brennan a pretty significant head injury. It’s Victoria’s decision, though, to let him die, a decision she asks Patrick to assent to. Patrick has now killed two people in service of Victoria, which is kind of stunning, considering how short of a time they’ve known each other and how little we honestly know about Patrick beyond this. Revenge has figured out a lot of things about the type of stories it wants to tell and the show it wants to be this season, but the shallowness of Patrick’s character is an example of how, while the show has a great handle on the larger story beats, it is struggling to grasp onto its characters in the same way it could in season one. This was a wonderfully soapy and twisted episode, and fairly satisfying to watch. But how great could it have been if we knew more about Patrick? If we cared more about him? Revenge has come a long way to bounce back from season two, but it still has a bit more work to do. So Nico kidnapped Aiden and set a trap for Emily why? If she wanted to get rid of Aiden for revenge, she should have just gotten rid of Aiden. This is why Emily is better than you, Nico. Jack and Margaux are buying a house together. That seems smart and not too soon at all. Charlotte is going to be an intern at Voulet. I really wish Charlotte would have gotten into the design institute so she could go away and have her boring birthday parties somewhere else.